Report by the State Council of Higher Education for Virginia puts Mason at the top of Virginia schools for the highest average starting salary of students who received a bachelor’s degree. 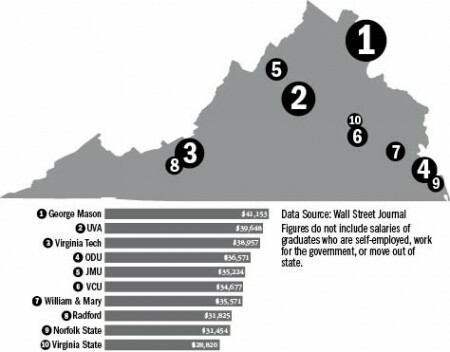 The Wall Street Journal published a graphic on Feb. 12 that made the conclusion that students who receive a bachelor’s degree from Mason, get the highest starting salary out of the public schools in Virginia. The statistics are from a report from the State Council of Higher Education for Virginia (SCHEV) from the 2009-2010 reporting year. The information released only includes graduates working in Virginia. Those who work for the U.S. government are self-employed or moved out of Virginia are not included in the statistic. In the same report, SCHEV released other statistics about the students who completed a four-year bachelor’s degree in the degree years between the reporting years 2005-2006 and 2009-2010. Out of 19,391 graduates, 47.7 percent have full-time wages, 11.2 percent enrolled at another institution in Virginia, 11.3 percent have part-time wages. The SCHEV is able to report salary and graduation outcomes due to the Virginia’s Higher Education Opportunity Act of 2011. This information also includes the amount of debt students have after attending private and public colleges but also does not include information on graduates who obtain a government job, join the military or work outside Virginia. According to The Washington Post, those who support the new database believe that incoming college students and their families should have access to this information before making decisions on which colleges to attend. Those who oppose the new database are fearful that incoming college students will choose schools and majors based off of how much money they will earn. Federal and state officials are working together in order to pass legislation for other states to provide this type of public information as well. During the week of Feb. 13, Senators Ron Wyden (D., Ore) and Marco Rubio (R., Fla.) planned to reintroduce the Student Right to Know before You Go Act, a bill that would legalize providing public record of this information. Other states that plan to provide this information include Tennessee, Arkansas, Colorado, Nevada and Texas. Recent Mason graduates who have obtained bachelor’s degrees in psychology and information sciences earned salaries that have topped the state’s average and gone beyond what other graduates from Virginia colleges are earning eighteen months after receiving similar degrees. According to a report by The Washington Post, the starting median salary in the state of Virginia for a Mason student with a degree in psychology is $30,256 while the starting median salary for a Mason student with a degree in information sciences is $55,213. *To read the entire report on wages of graduates from the State Council of Higher Education for Virginia click here.